How is The Voice like Education? Do you ever sit in church, listening to a sermon and wonder how the pastor made that connection between something in his day-to-day life and scripture? Well, I had one of those moments after watching the opening night of the “blind auditions” on The Voice Monday night. 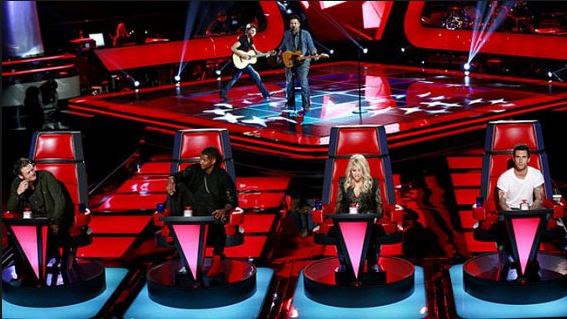 In case you don’t watch the show, the first shows are of the four judges listening to singers with their backs to them. The idea is that the judges won’t have any biases based on the performer’s appearance. Instead, they are able to fully focus on the performance. How does this relate to education, you might wonder? Hmmm…I’m glad you asked. All too often throughout my years as an educator I have heard teachers talking about the incoming students . Last year’s teacher gives “advice” to the new teacher, sharing behaviors, strengths/weaknesses, and personal feelings. The sad part of this is that the kids are entering the class with biases already created by their new teacher. There are certain bits of information that may be important to share as a child leaves your class to go on to the next, however, most should be left to be discovered by the new teacher. This enables the teacher to form her/his own relationships, focusing on the learner and not on preconceived notions. On The Voice blind auditions, if a judge likes what they hear, they turn their chair around to show interest, and a desire to have that contestant on their team. It’s a huge deal to get a “four-chair turn”. If one judge turns around then the performer automatically moves on to the next round, but to get multiple judges turning around is pretty amazing. They get to pick which judge’s team they want to be on. These people are putting their dreams on the line, being vulnerable in front of millions of people. Our students come to class each day vulnerable. Their dreams are being discovered, molded, and nurtured each day…or they’re not. They feel like their teacher wants them on their team each day…or they don’t. They go home each day feeling like they had a ” four-chair turn” with this amazing confidence-boost…or they don’t. Teachers are leaders. They have so much power. Let’s use it to build the students and encourage their dreams. This entry was posted in Education and tagged relationships, students, teachers. Bookmark the permalink. 1 Response to How is The Voice like Education? Some things that this comparison doesn’t cover include the following: The Digital Divide, aka the geographic ( poor or lacking I.T. infrastructure and more stringent technology policies within other countries (ie. China) and social/economic boundaries that keep students from being able to be as tech savy as their counterparts. The Voice does give chances to people that don’t have the connections to the industry, but need it. Those are the heart warming stories that I really enjoy. Unfortunately, we can’t say the same thing with regards to technology and students. I will say that the Voice does touch on the ones that get no chairs turned or maybe for education it would be the students that aren’t able to perform in class or even simply attend. It sometimes is that way. There’s a lot of reasons for this that I’ve seen at the collegiate level, and some of them are as simple as life getting in the way of education. Whether we’re talking about Military duty, death in the family, computer hard drive failure,etc.